When life gives you a four foot grease fire, make smores! Do you rely on measurements and recipes to cook? Why not try letting your creativity flow and just make it up! I never followed recipes myself and have ended up with great results. Trial and error is the best way to make delicious food catered to your own tastes, something you can't get by following someone else's recipe. If you want to know a little more about how cooking can make you happy and free you from a boring, bland, and repetitive lifetime of what someone (or something) else has prepared for you should get started with my WHY COOK? section! And on days I don't post any recipes you can enjoy some random product reviews and other food/kitchen related posts! Ok. Maybe now I will post more because I found an app! Since we didn’t do any grocery shopping until today, yesterday and the day before I had to come up with something that my boyfriend would enjoy once again with what little we had left in the apartment. Technically we could have survived another couple of days if not a month with what we had, but I guess he would have gotten a bit tired of eating pasta. The second dish was my attempt at making something that would look like mac-and cheese without using cheese (since we were out). 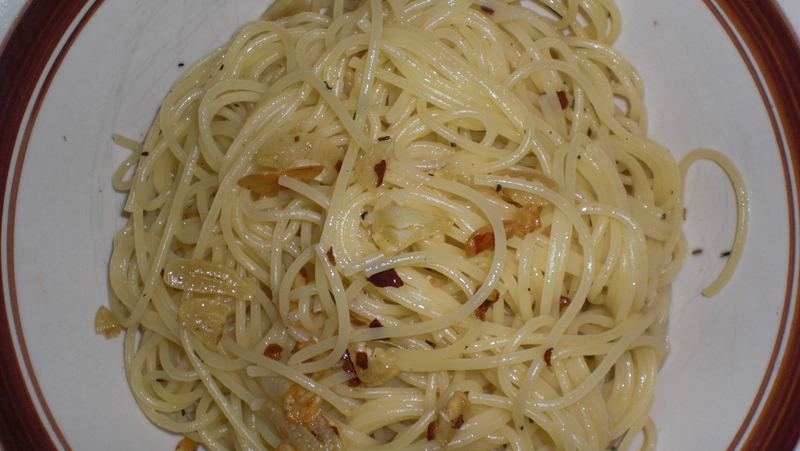 Spaghetti (I usually go for the thinnest). Thyme (my mom usually would use fresh parsley but this is all I had). Chop the garlic (two cloves should do) and place in pan with olive oil. Cook on medium-low heat until the garlic is crispy and brown on the edges. Don’t burn. Add the herbs in the oil as well and turn the heat off. Add two pinches of salt and the chili pepper. Boil up the spaghetti (mixing often to prevent sticking) for the amount of time mentioned on the box. Drain the pasta and place in pan with oil. Mix well and taste to make sure it is salted enough. Place some in a dish and enjoy! Tip: This is a very simple dish that only takes minutes and requires very little preparation. If you wish you can cook up some vegetables separately and even add some bacon to mix in! Vegetable tomato juice such as V8. Boil the penne according to the instructions (with a pinch of salt). Fry up the garlic and the onions as explained in the above recipe but replace olive oil with butter. Also add the herbs. Add a cup of V8 and a cup of cream. Add the chili pepper and let it simmer for 20 minutes on low. To speed up the process you can mix two teaspoons of corn starch with cold water and melt it thoroughly then place in the sauce to help thicken. 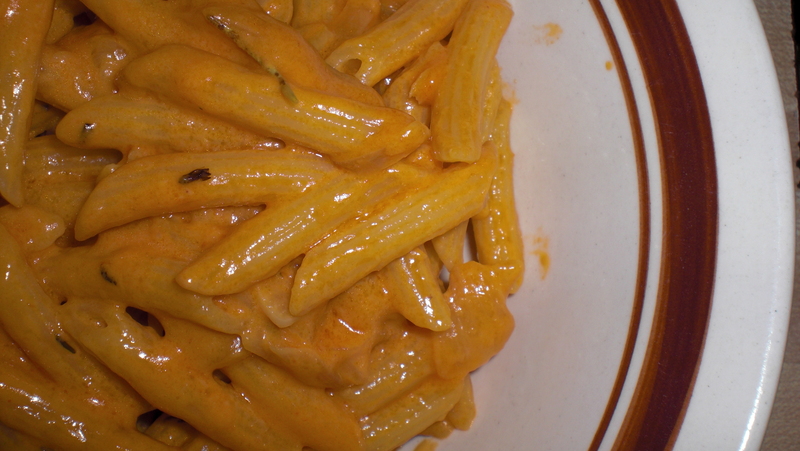 Once the sauce is as thick as you like, mix in the pasta. You can add Parmesan cheese too add a nice cheesy touch to it. Dish it out and enjoy! Tip: Remember, you can always add whatever extras you want. I used minimal ingredients because we were completely out of food, but this dish would be great if you added broccoli and even Brussels sprouts or bacon to the onions and garlic.